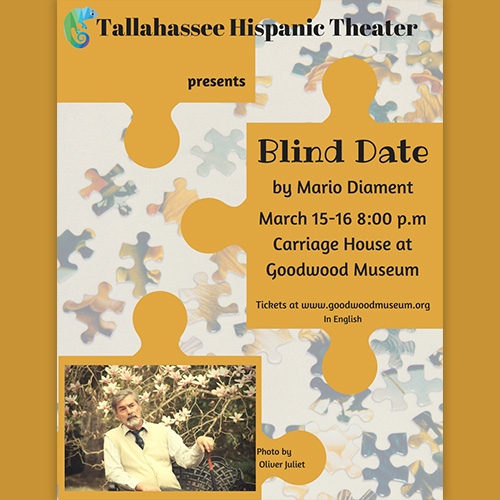 Tallahassee Hispanic Theater will perform the play “Blind Date”, inspired by the writings of Jorge Luis Borges, an Argentinian poet, essayist and short-story writer. The play tells the story of an elderly blind man who draws confessors to him as he sits on a park bench. They discuss mid-life crises, time, love, fate and missed opportunities while addressing universal human concerns. The play will be staged in the Carriage House at Goodwood Museum & Gardens on March 15th and 16th. Both performances are at 8 p.m. Tickets are $15, or $12 for seniors, students, or Goodwood members. The author of Blind Date, Mario Diament, M.A. is an associate professor at Florida International University. He was born in Argentina, and is a veteran foreign correspondent and a former executive editor of one of the leading newspapers in Buenos Aires. Diament has had his plays produced in the U.S. and abroad. For his playwriting he has won the following awards: the New York Critics’ ACE Award for Best Play Blind Date, New York; the ACE Award (Critics’ Association) for Best Play Tierra del Fuego, Buenos Aires, Argentina; the María Guerrero Award, Best Play for A Report on the Banality of Love, Buenos Aires, Argentina; the Florencio Sánchez Award Best Play for A Report on the Banality of Love, Buenos Aires, Argentina, and the ACE Award, Best Play for Blind Date, Mexico City, Mexico. “Blind Date” is directed by Judi Persons, and the cast consists of an ensemble of great actors from our community: Lanny Thomas, Marcy Palmer, Robin Jackson, Victor Duncan, and Louise Ritchie. It will be in English.